Tim Springer/WildEarth GuardiansGray wolves of the Yellowstone pack. One member has made its way as far south as Eagle County. A wolf from the Yellowstone area has roamed into Eagle County, delighting wildlife proponents but likely reigniting consternation among Colorado ranchers.The 18-month-old female, known as 314F, was tracked as recently as Sunday through a GPS radio collar to an area north of Avon, marking the second confirmed presence of a wolf from that pack to make its way to Colorado.Young wolves often cover remarkable distances looking for a mate and a new territory, said Colorado Division of Wildlife director Tom Remington. If this wolf doesnt find a pack, shell likely keep moving. Weve seen at least one Yellowstone wolf in Colorado before, but we have no reason to believe that wolves have established a pack in the state yet.The wolf, part of the Mill Creek pack in southwestern Montana, was given a collar by Montana Fish, Wildlife & Parks as part of a research effort with the University of Montana to improve monitoring techniques. According to satellite data, the wolf passed south through Yellowstone National Park and the Bridger-Teton National Forest in western Wyoming, southeast of Pinedale. She then traversed widely through southwestern Wyoming and wandered through southeast Idaho and northeastern Utah before crossing into Colorado within the past two weeks. The wolf is now 450 miles from its origin but has traveled at least 1,000 miles overall. This kind of activity is what they do when theyre in search of a mate. And its what helps keep the gene pool diverse, said Rob Edward, a carnivore-restoration expert with WildEarth Guardians. He suggested that her travels indicate ample habitat for wolves here in the southern Rockies and the possibility that a pack established here could interbreed with those from the Yellowstone area. 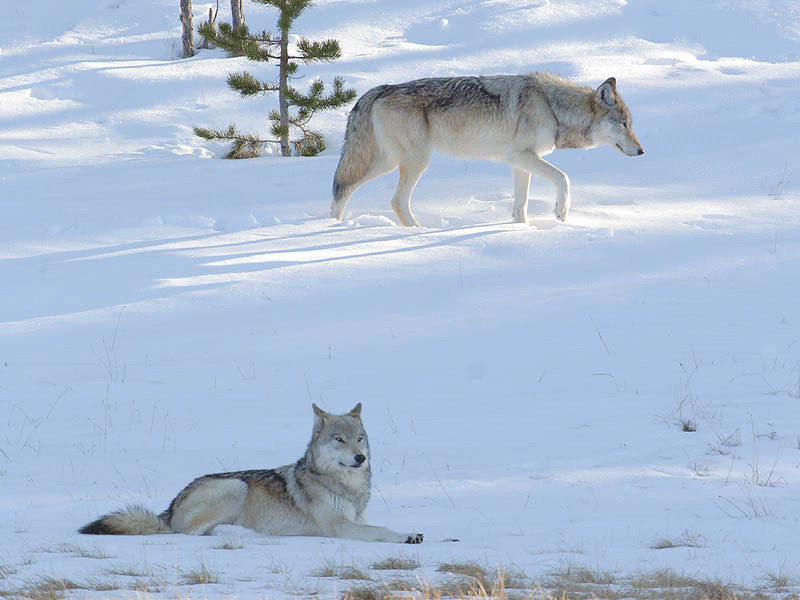 Biologically, a single wolf straying this far from her pack is virtually insignificant, and in all likelihood, she will not survive on her own but may instead return to her home range.Symbolically, however, a wolf that roams from a pack inspires advocates, who argue that top-level predators are necessary to restore ecological balance and keep populations of prey species in check.It kindles the imagination of people who understand that, without wolves, we really dont have wild. And it rekindles the debate about restoring wolves to the region, which is something we need to do now, Edward said.Colorado ranchers, however, consistently have objected to the reintroduction of wolves to the state, fearing losses in livestock to predation.Particularly problematic are interactions between wolf populations and domestic livestock populations, wrote two past presidents of the Colorado Cattlemens Association, Vernon Sharpe and Tom Compton.Because wolves are listed as endangered species, ranchers are forbidden to kill, trap or harass them even to protect wildlife unless the predator poses a legitimate threat to human safety.Wolves formerly roamed throughout much of North America, feeding on bison, elk and deer. They were systematically eradicated by ranchers and through a federal extirpation program, with the last ones in Colorado killed in 1943.Proposals to reintroduce wolves to Colorado have failed to gain traction, although state policy does establish that any migrants will have free range.Although its not particularly unusual for wolves to travel so far, the only other time that a Yellowstone wolf has been confirmed in Colorado was in 2004, when one was struck and killed on Interstate 70 near Idaho Springs.Two years ago, state wildlife managers were able to capture a brief video of a suspected wolf about 10 miles south of the Colorado-Wyoming border near Walden. Biologists and wolf specialists who examined the video said the animal looked and behaved like a wolf, but the sighting could not be confirmed with certainty. There are an estimated 6,400 wolf-dog hybrids in Colorado kept as pets and untold numbers of captive-bred wolves.Ed Bangs, a biologist with the U.S. Fish and Wildlife Service, said the travels of this female is perfectly normal wolf behavior and that shes capable of surviving on her own, but he expected that she would not find a mate and likely would return.Theres an old Russian proverb, he said, that a wolf lives on its feet.